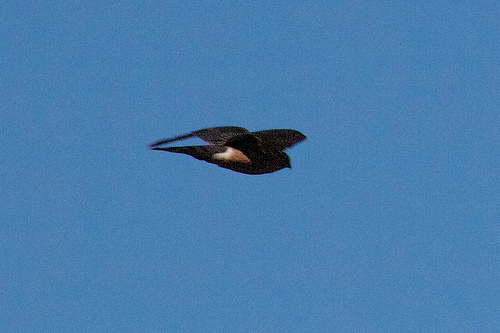 For a while now I’ve noticed a couple birds of prey around our hood. 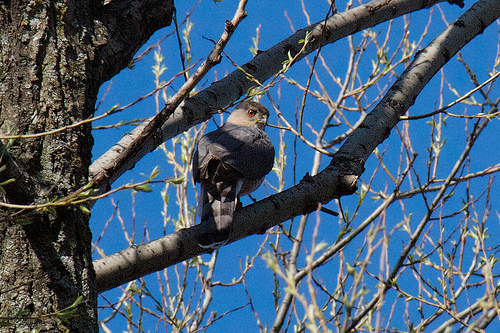 A couple years ago I snapped a photo of one in the tree across the street, guessing that it was a Cooper’s Hawk, and earlier this spring I often saw a couple of them flying around within our block. 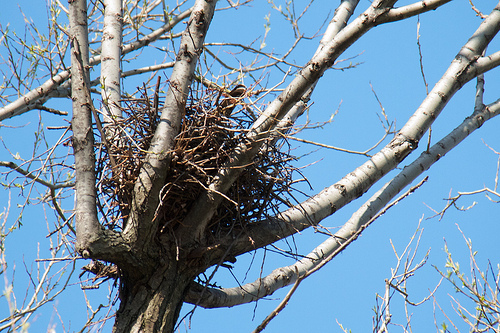 About a week and a half ago I noticed one swoop in over the park where we take Luna to play fetch, and saw it land in one of the willows there, at a nest, and so I’ve been trying to figure out what they are ever since. This morning I took Luna to the park again and the pair of birds were hanging out in the tree, one on the nest, the other chilling out on a branch. And of course I left the camera at home. So after a good game of fetch I took Luna home and grabbed the camera and went back. Of course by then the birds were getting a bit more active and I only had about five minutes before they were off hunting and out of sight. I didn’t have the camera settings correct so these are pretty grainy but that first one is shows a pretty decent amount of detail. From everything I’ve read and looked at I really can’t tell what differentiates a Cooper’s Hawk from a Sharp-Shinned Hawk, aside from their eye colours (and even Sharp-Shinned Hawks get redder eyes the older they get). So my best guess is a Cooper’s Hawk unless someone can correct me. Even their calls are quite similar. Their colouring and markings are remarkably similar. In these two, the barring is subtle and almost invisible, and their overall body colouring is quite light — grey on the back and rusty/creamy undersides. Their tails are barred with black and tipped with a bit of white.